Material: Aluminum tube + oxford cloth. 1.Durable and comfortable: folding camping stool is made of Oxford cloth and high quality steel pipe. The steel frame is ultra-light and the aluminum legged design can provide better support. strong and durable, the seat is soft and comfortable. Even if you sit on a camping stool for a long time, you will not feel tired. 2.Easy to open and fold: The stool is folding design, so it is easy to open or fold in seconds,save a lot of space. 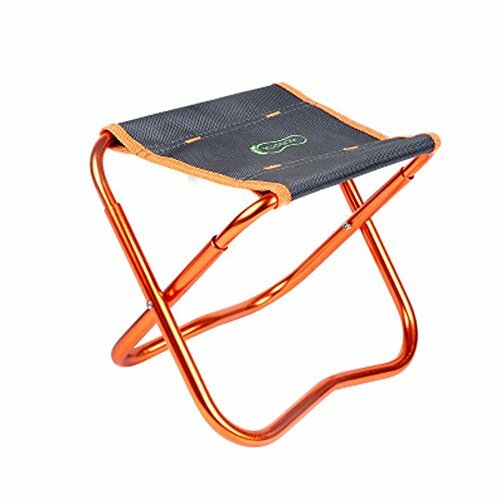 3.Multipurpose: Portable camping chair for all outdoor and indoor activities such as bedroom, dormitory, office, swimming pool, patio,yard, beach, sports meeting, picnic party, camping, barbecue, fishing, hiking. 4.Sit comfortablely anywhere you go:This folding stool is lightweight ,foldable and compact. It can be folded to the size that fits your backpack so you can carry it around easily. 5.With it, Let Your Life More Happy: Wherever You Are,Open It Up and Sit Down When You Are Tired;After a Bike Ride to the River, It Was Nice to Have a Seat to Watch the Sunset;Works Great for Both Painting and Playing Cello Outdoor and So On. Package include:1 x folding stool,1 x Storage bag. Easy to Open and Fold: No tools needed! The stool is folding design,coming with a storage bag so it is easy to open or fold in seconds when you need to use it at anytime and help you save much time.easy to transport and storage. Sit comfortablely anywhere you go:This folding stool is lightweight ,foldable and compact. It can be folded to the size that fits your backpack so you can carry it around easily. Durable and comfortable: folding camping stool is made of Oxford cloth and high quality steel pipe. The steel frame is ultra-light and the aluminum legged design can provide better support. strong and durable, the seat is soft and comfortable. Even if you sit on a camping stool for a long time, you will not feel tired. Great for all kinds of outdoor and indoor activities:Perfect to be used indoors,such as bedroom,dorm,office,pool,yard,patio,; you also can bring it to outdoor and take in outdoor activities such as beach, patio,sports. Package include:1 x folding chair. If you have any questions about this product by HUPLUE, contact us by completing and submitting the form below. If you are looking for a specif part number, please include it with your message.